The 10X Rule is the single most important principle or ingredient needed to achieve extraordinary results. This book explains how you can use big thinking and massive actions to create unstoppable momentum for phenomenal success. In The 10X Rule summary, we’ll give an overview of the 10X Rule, its key principles and components. For the full mojo, do get a copy of the book, or get a detailed overview with our complete book summary bundle. • We underestimate the amount of effort/resources needed to achieve our goals, and the number of challenges we must overcome. We end up getting disappointed, discouraged and quit or shift our goal-posts. The key to success is to prepare yourself mentally for the actual amount of work needed and build in the buffers for unplanned variables that’ll crop up. The 10X Rule says that you can only achieve phenomenal success if you upsize your thinking and action: set targets that are 10X bigger and take 10X the amount of action. This single discipline will make the biggest difference between massive success and failure. Fundamentally, success is about attaining your desired outcomes. It’s subjective as we all define success differently and have varying goals at different points in our lives. Regardless of how you define success, it’s vital that you start with a desire to achieve it. Remember: success is something you create, and there are infinite ways to do so through new innovations, ideas, solutions etc. It’s your duty and responsibility to fulfill your potential. 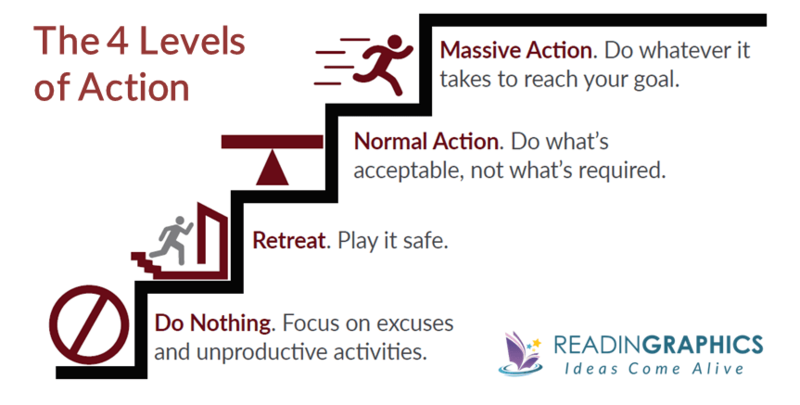 Generally, there are 4 levels of action that all of us use at some point in our lives, though most people stay at the first 3 levels most of the time. To achieve massive results, you need to take massive (Level 4) actions. Here’s an overview of the 4 levels of action. Do get more details from The 10X Rule book or our full 12-page summary. Being “average” is a formula for failure. You don’t gain enough momentum for real success and tend to lose what you have during bad times. Cardone shares statistics and anecdotes to show why the most successful people make hundreds of times more money than average people–because they set 10X goals backed by 10X actions. Make sure your goals are (a) big and exciting and (b) aligned with your purpose, so you’ll feel motivated to think and act on them every day. Benchmark your goals minimally against the top players in the field. • Do what you fear. • Don’t manage time. Optimize it. • Go for market share, not customer satisfaction. Check out the book/ our complete summary for specific tips on each of the areas above, e.g. how to take control of your situation and overcome your excuses, dominate your sector and build market share/omnipresence, overcome fears/criticism, optimize (and multiply) your time etc. In the book, Cardone also breaks down 32 traits/habits that define the differences between successful and unsuccessful people. In our full summary, we’ve condensed these into 8 key principles. • Make an initial list of your 10X goals. At this point, don’t reduce the size of your goals nor worry about how you’ll achieve them. • Start taking action immediately, regardless of how you feel and don’t prematurely evaluate the outcome of your actions. • Review and rewrite your goals daily when you wake up and before you go to sleep. Remember the points above, and keep pushing ahead toward your dreams and goals. 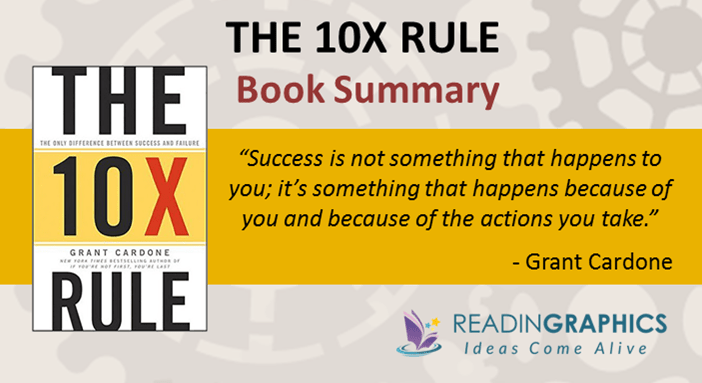 In the book, Cardone shares many of his personal observations and experiences about success. Each chapter also includes a short exercise to help you recap what you’ve learnt. Do get a copy of the book for the full details, get our full summary bundle for an overview of the various ideas and tips, or check out more resources at grantcardone.com. Start building momentum for Massive Success! 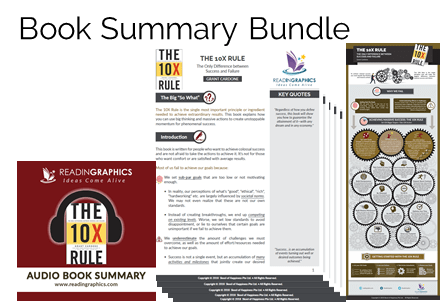 Click here to download “The 10X Rule” book summary and infographic.